29 Jan 2019 --- The importance of whole grains for a nutritionally balanced diet escapes roughly 90 percent of UK consumers, according to a recent study commissioned by Nestlé Cereals. The survey respondents were unsure about why whole grains are significant and which foods contain them. Earlier this month, a Lancet study, commissioned by the World Health Organisation (WHO), found a link between higher intakes of dietary fiber and whole grain foods, as well as a reduction in the risk of a wide range of diseases, including coronary heart disease, stroke, Type 2 diabetes, colorectal cancer and their risk factors. The survey noted that nearly 74 percent of consumers are unaware that whole grains may help reduce the risk of Type 2 diabetes, while an additional 45 percent doesn’t know how whole grain products benefit heart health when regularly consumed, as part of a healthy diet and lifestyle. The findings of the study also revealed that people may not be getting enough whole grains as 87 percent said that they did not know which foods contain whole grains or what their nutritional importance is. Almost 1 in 10 respondents believed that bananas contain whole grains, while 41 percent were unaware that porridge and breakfast cereal actually contain it. 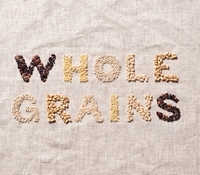 Click to EnlargeWhole grain products contain a wide range of vitamins, minerals, fiber, starch and other nutrients. The UK has limited dietary guidelines for whole grain, while in other countries, such as the US, it is recommended that adults eat 3-5 servings of whole grains per day. When asked about their fiber intake, more than 50 percent of the respondents admitted they don’t think they eat enough fiber. 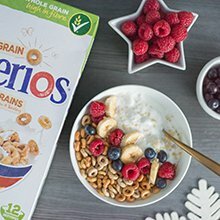 The survey’s release coincides with Nestlé Cereals’ campaign “Great starts with whole grain,” which aims to educate consumers on the benefits of eating more whole grains. Nestlé Cereals products displaying a green banner are high in fiber and contain whole grain as their main ingredient. The green banner seeks to act as a reminder for consumers to eat a serving of whole grain each day. The campaign features Nestlé Cereals products such as Shredded Wheat, Shreddies and Cheerios. “Whole grains play an important role in a healthy, balanced diet but unfortunately, as our research shows, many people have a limited understanding of their benefits,” says Toby Baker, Marketing Director UK & Australia, Nestlé Cereals. “Whether it’s not knowing which foods contain whole grain or not realizing that whole grain is a source of fiber, vitamins and other nutrients, it’s clear that there are a lot of misconceptions among UK consumers,” he notes. Additionally, on the whole grain front, new data on the links between diet and health show that replacing refined grains with whole grains globally could reduce the burden of chronic disease more than any other change – including better-known approaches such as reducing sodium, eliminating trans fats or even cutting sugar-sweetened beverages. Moreover, a recent Danish study revealed that whole grains – from rye and oats to wheat – can help prevent Type 2 diabetes, particularly when consumption levels are high. Previous studies have flagged whole grain’s potential in Type 2 diabetes prevention but did not identify the role of different whole grain sources, as well as the quantities needed to reduce the diabetes risk. The study included 55,000 participants and spanned 15 years.